Winter War Army Operations: Having destroyed the Soviets in the village of Suomussalmi, on 1 January 1940 the Finns decide that now is a good time to start finishing off the trapped Soviet relief column on the Ratte road. The Soviets could easily walk out through the woods - the Finns don't have nearly enough men to surround them - but they remain passive. While this may seem unwise, they are forbidden to retreat by orders. Those disobeying such orders invariably are shot upon their return to the USSR. The men also largely are from the Ukraine and know nothing about the frozen lakes and forests of Finland. The Finns for a change have numerical superiority. They deploy the 64th, 65th, and 27th Infantry Regiments, and the 22nd Light Unit, 1st Ranger Battalion and 15th Detached Battalion. The Soviets on the Ratte road only have 7 battalions, but they have extensive armor and artillery - which is virtually useless in the forest except as immobile shelter. The Finns start attacking at 14:00. The 1st Ranger Battalion and the 1st Battlion 27th Infantry Regiment attack the Soviet 2nd Battalion, 146th Rifle Regiment (Captain Pastukhov). The Soviets hold their position (they have nowhere to go) and inflict heavy casualties on the Finns. Late in the day, the attack resumes, and this time the Finns do better. The Soviets sustain heavy casualties (211 killed or wounded) and Pastukhov has to withdraw down the road. The nearby 146th Rifle Regiment sends its 1st Battalion, which manages to restore the situation, but after they Pastukhov and his men are completely isolated and on their own, without supplies or reinforcement. 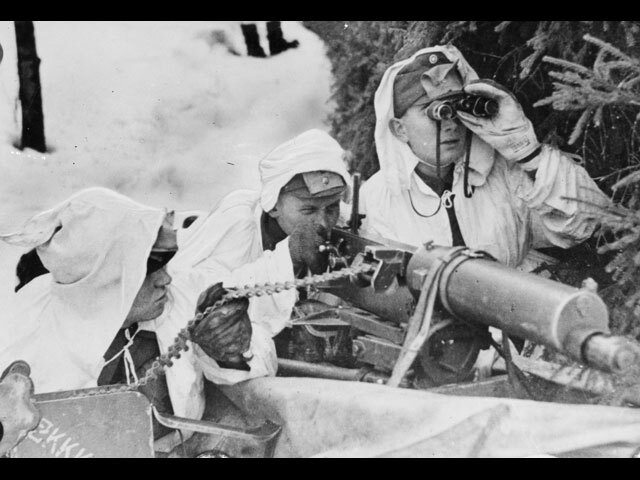 General Siilasvuo sends 1000 skiers of the 1st Battalion of the 27th Infantry Regiment under Captain Eino Lassila 5 km down the ice road parallel to the Ratte road. They then traverse three miles of forest and deep snow until, at 23:00, they finally are in position on a hill overlooking the stranded 3rd Battalion of the 122nd Artillery Regiment (Captain Revchuk) of the Soviet 44th Rifle Division on the road. The Soviets have insufficient sentries and their security arrangements are lacking, assuming the deep forests protect them. The Finns attack a 500 m section with 6 Maxim machine guns and wipe out the 9th Battery to the last man. Many of the remaining Soviets flee into the woods. Captain Revchuk tries to fire the artillery himself with a few remaining men, then runs down the road toward the nearby 146th Rifle Regiment. He brings back two T-20 Komsomolets gun tractors, but is refused infantry support (the 146th is between two separate outfits being attacked). The Finns quickly destroy the two T-20s, and Revchuk and his remaining men flee back to the 146th Rifle Regiment. In summary, the Finns have begun separating the different sections of the 20-km long Soviet convoy and destroying it in detail. Winter War Air Operations: The Soviets attack Turku and burn down the historic castle. U-58 (Oberleutnant zur See Herbert Kuppisch) torpedoes and sinks Swedish freighter Lars Magnus Trozelli 50 miles northeast of Aberdeen. Seven crew perish. British freighter Liberty hits a min and sinks. The German freighter Tacoma returns to Montevideo and is interned due to its assumed previous assistance to the Admiral Graf Spee. The City of Flint (now a Norwegian vessel) collides with British freighter Baron Blytheswood at Narvik and sustains minor damage. US freighter Exeter is detained at Gibraltar by the British. Convoy OA 64 departs from Southend, COnvoy OB 64 departs from Liverpool, Convoy 13F departs from Milford Haven, and Convoy SL 16 departs from Freetown. European Air Operations: The Luftwaffe raids Sullom Voe in the Shetland Islands with Dornier Do 17 and Junkers Ju 88 bombers. It is a key flying boat base which has Catalinas and Sunderlands. The RAF Coastal Command Gloster Gladiators flying out of RAF Shetland Fighter Flight at Sumburgh Aerodrome intercept them and shoots down a Junkers Ju 88. British light cruiser HMS Coventry sustains damage. British Government: The King issues a Royal Proclamation requiring military service for men aged 20-27, some 2 million men. Some 50 women of the Auxiliary Fire Service resign after being told to scrub floors. French/Spanish Relations: The two countries re-open rail links, which were closed in 1936 due to the Spanish Civil War. Italian/Soviet Relations: Following anti-Soviet demonstrations in Rome due to the Winter War, the Soviets recall their ambassador to Italy, and the Italians recall theirs from Moscow. Denmark: The Prime Minister and the Foreign Minister address the nation and give a pessimistic view of the likelihood of retaining the country's independence. Turkey: The natural disasters continue, as 32,741 are said to have died as a result of floods after the recent earthquake. Chinese 9th War Area cuts Japanese supply lines. The Japanese, despite the resumption of Chinese attacks, are still feisty. They open attacks on the the Chinese 2nd War Area to relieve their 36th Infantry Division at Changtze and Tunliu. The Japanese also prepare for an offensive at Paotou against Chinese 8th War Area around Wuyuan. At the Battle of South Kwangsi, the Chinese clear Kunlunkuan and surrounding areas, inflicting severe casualties on Chinese 5th Infantry Division and killing a brigade commander. American Homefront: A huge fire devastates portions of Hoboken, New Jersey. 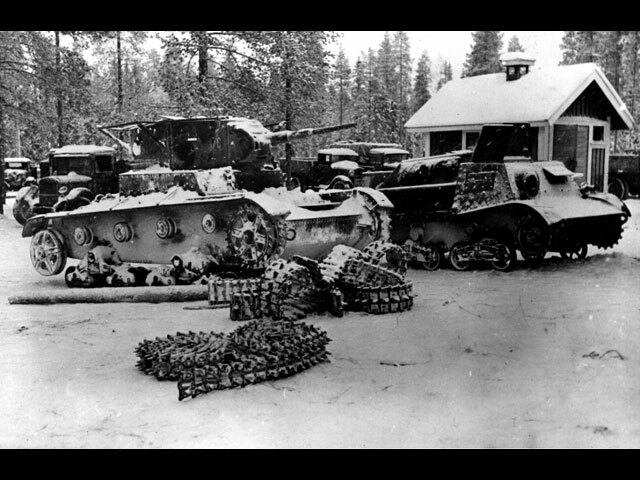 Captured Soviet tanks and other armor, stripped of their treads.